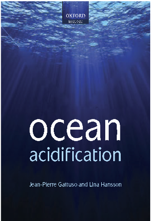 • CO2 emissions are changing ocean carbonate chemistry at an unprecedented rate. • Effects of climate changes are tested in species representative of the basis of the trophic web. • pH homeostasis has energetic costs that divert energy from cellular processes. • Further studies are needed to assess effects on ecosystem structure changes. Recently, there has been a growing concern that climate change may rapidly and extensively alter global ecosystems with unknown consequences for terrestrial and aquatic life. While considerable emphasis has been placed on terrestrial ecology consequences, aquatic environments have received relatively little attention. Limited knowledge is available on the biological effects of increments of seawater temperature and pH decrements on key ecological species, i.e., primary producers and/or organisms representative of the basis of the trophic web. 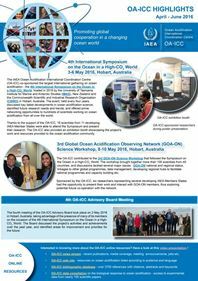 In the present study, we addressed the biological effects of global warming and ocean acidification on two model organisms, the microbenthic marine ciliate Euplotes crassus and the green alga Dunaliella tertiocleta using a suite of high level ecological endpoint tests and sub-lethal stress measures. Organisms were exposed to combinations of pH and temperature (TR1: 7.9[pH], 25.5 °C and TR2: 7.8[pH, 27,0 °C) simulating two possible environmental scenarios predicted to occur in the habitats of the selected species before the end of this century. The outcomes of the present study showed that the tested scenarios did not induce a significant increment of mortality on protozoa. Under the most severe exposure conditions, sub-lethal stress indices show that pH homeostatic mechanisms have energetic costs that divert energy from essential cellular processes and functions. The marine protozoan exhibited significant impairment of the lysosomal compartment and early signs of oxidative stress under these conditions. Similarly, significant impairment of photosynthetic efficiency and an increment in lipid peroxidation were observed in the autotroph model organism held under the most extreme exposure condition tested. Gomiero A., Bellerby R. G. J., Manca Zeichen M., Babbini L. & Viarengo A., 2018. Biological responses of two marine organisms of ecological relevance to on-going ocean acidification and global warming. Environmental Pollution 236: 60-70. Article (subscription required).